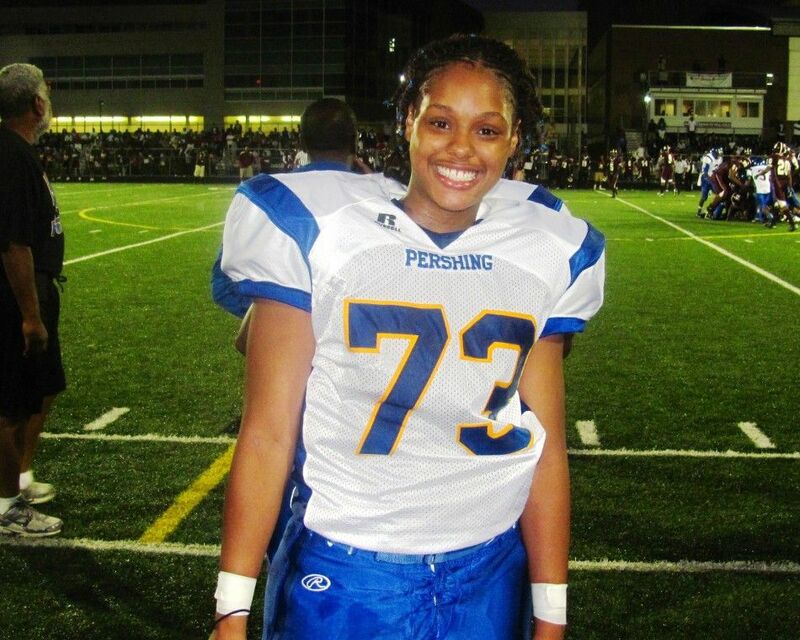 The Detroit Public School League fall season for girls’ athletics won’t begin until Sept. 9, but Pershing High’s Monique Howard has already distinguished herself as the girls’ first PSL Proud Strong Learner of the Week for 2011-12. Howard, 16, is the barrier-breaking starting right tackle who, at 6-0, 190 pounds, more than held her own against the boys in Pershing’s 18-12 overtime victory against Renaissance last Friday to open the high school football season. 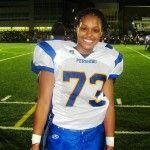 While there have been a few other girls who’ve played PSL football through the years, Howard, a power forward-center for Pershing’s state-ranked girls’ basketball team, might be the first girl who played such a prominent role at a position that requires muscle and strength. Spann admits he didn’t take Howard’s pursuit of football seriously when she first approached him about playing. Spann insists that Howard won’t get any special treatment because of her gender. Howard says her favorite school subject is Math. She hopes to earn a college scholarship to play basketball and earn a degree. She plans to major in criminal justice and pursue a career as a detective. As an interested spectator at last Friday’s game, Renaissance girls’ basketball coach Diane Jones marveled at Howard’s fearlessness and toughness on the field and could only imagine the force she’ll be this winter. “She’s going to be a beast on the basketball court,” Jones said. Hill was also correct in telling Howard that playing football would bring her a lot of publicity. In a matter of a week, the media buzz turned into a media blitz as Howard was featured in front-page stories in the Detroit Free Press and Detroit News and on a live segment on WDIV TV’s Local 4 News. The PSL’s Proud Strong Learner of the Week Award, representative of the league’s top boys’ and girls’ athletic performers as nominated by their coaches, is sponsored by McDonald’s owner-operators of Detroit.